#GetOutOneYearLater showing at 55 AMC Theatres Nationwide to Guests of the 7:00 P.M. Screenings on Monday, February 19 for Free. 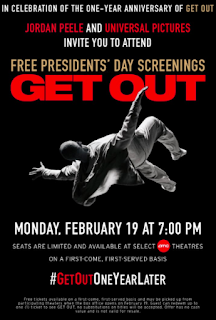 Filmmaker Jordan Peele, in conjunction with Universal Pictures, today announced free screenings of Universal’s Get Out on Presidents’ Day, February 19, at 55 AMC locations nationwide. Each guest who requests a ticket the day of the screening—at a participating location—will be given one free admission to the 7:00 p.m. showing, up to theatre capacity. Markets that will playing Get Out on Presidents’ Day include ones in Atlanta, GA; Baltimore, MD; Boston, MA; Charlotte, NC; Chicago, IL; Cincinnati, OH; Columbus, OH; Dallas, TX; Denver, CO; Detroit, MI; Houston, TX; Indianapolis, IN; Jacksonville, FL; Kansas City, MO; Los Angeles, CA; Miami/Ft. Lauderdale, FL; Minneapolis, MN; Nashville, TN; New Orleans, LA; New York City, NY; Oklahoma City, OK; Orlando, FL; Philadelphia, PA; Phoenix, AZ; Pittsburgh, PA; Raleigh/Durham, NC; San Diego, CA; San Francisco/Oakland/San Jose, CA; Seattle/Tacoma, WA; St. Louis, MO; Tallahassee, FL; Tampa, FL; and Washington, D.C.